NASA today sent a super-shielded spacecraft known as the Parker Solar Probe on a mission that will take it closer to the sun than any other spacecraft has flown, with the probe’s namesake, a 91-year-old physicist, watching the launch. 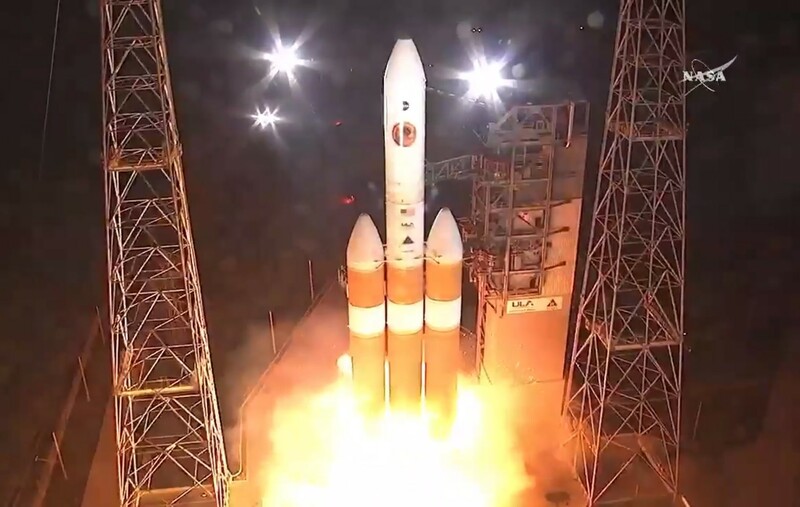 A blazing United Launch Alliance Delta 4 Heavy rocket rose into the night sky from its launch pad at Cape Canaveral Air Force Station in Florida at 3:31 a.m. ET (12:31 a.m. PT), one day after concerns over a data glitch forced a postponement. Three rocket stages powered the probe on the first leg of its sunward journey. “All I can say is, wow, here we go, we’re in for some learning over the next several years,” University of Chicago solar physicist Eugene Parker said just after liftoff. This entry was posted in GeekWire and tagged NASA, Parker Solar Probe, Space, Sun. Bookmark the permalink.